Overall, Michigan is behind the curve when it comes to e-filing divorce cases. Currently, there are no counties in Michigan that allow you to start a new divorce case online. Instead, to initiate a divorce case anywhere in the state, you have to file your Complaint for Divorce and Summons with the Circuit Court Clerk’s office, either in person or by mail. Once your case has been opened and a case number is assigned, only seven of Michigan’s 83 counties (Antrim, Grand Traverse, Leelanau, Macomb, Oakland, Ottawa, and Wayne) allow you to e-file your remaining divorce documents. Compare this to Michigan’s neighbor to the south, Indiana, where divorce cases can be e-filed--start to finish--in all but ten of its 92 counties without ever stepping foot in a courthouse. Likewise, in nearby Illinois, paper filings are no longer accepted and all divorce paperwork must be e-filed at every step in the process. According to Michigan’s rollout strategy, the long-term objective is for all eligible case types to be e-filed. In 2018, implementation in “waves” began and is expected to take place over the course of several years. However, if you compare the seven courts that have actually been implemented with the implementation schedule map provided on the Michigan Courts website (right), you’ll see that most waves haven’t been fully implemented before the next wave begins. 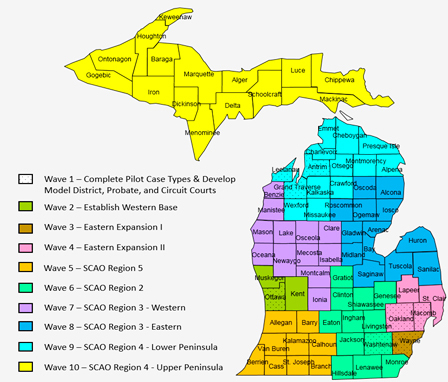 For example, Ottawa is the only county of the three Wave 2 counties to be implemented, and Macomb and Oakland have been implemented in Wave 4, but the two other Wave 4 counties have not. No counties in Wave 5 have been implemented at all, and of the 14 Wave 6 counties, only Antrim, Grand Traverse and Leelanau have been implemented. If you live one of the seven counties that have implemented e-filing, and you want to e-file the rest of your documents after filing your case in person or by mail at the Court Clerk’s office, you first need to sign up for a MiFile e-filing account. MiFile is powered by TrueFiling. On the TrueFiling sign up page you will enter basic contact information and choose a password. You will then get an e-mail from TrueFiling with directions for confirming your new account, which includes accepting the End User License Agreement. Once you’ve confirmed your e-filing account, login to your MiFile account and enter your case number. From there, you’ll be able to easily upload whatever documents you need to file at that stage in your divorce and submit them to the Court Clerk’s office. If you need help, you can contact the MiFILE technical support team at support@truefiling.com or (855) 959-8868. You'll need to tell them what county Circuit Court you're filing in, your case number, and a detailed description of your question or issue. Technical support is available Monday thru Friday, 9am – 6pm ET.